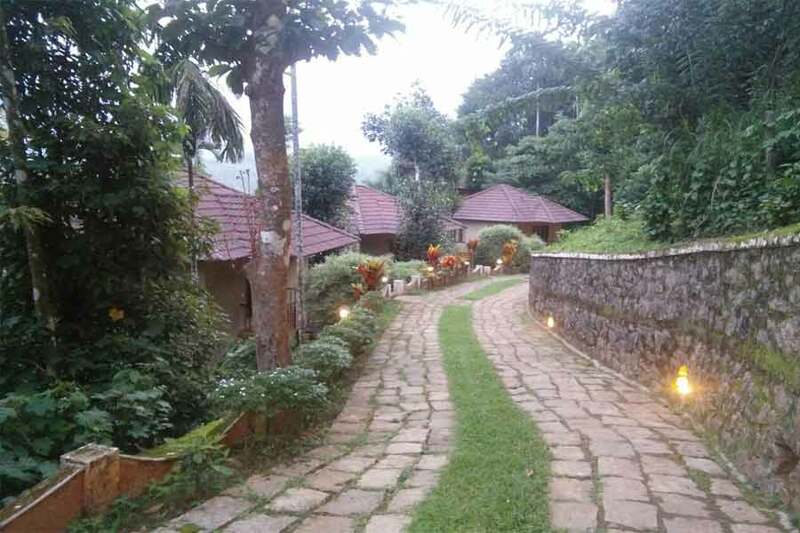 Valathur, Rippon P.O,Meppady, Wayanad,Pin Code: 673577, Kerala, India. Use the form below to inquire about Exclusive Resort Stay At Meppadi . Use the form below to reserve for Exclusive Resort Stay At Meppadi . Rising 2,500 feet above sea level, the pureness of the air and the pristine surroundings must be seen to be believed. From every room of this Exclusive Resort Stay at Meppadi, spectacular view of the mountains and valleys will leave guests mesmerized. Gaze upon the mist melting against the verdant woods and be transported to an enchanted dream world. The clouds descending on the mountain ranges to display a crowning glory are a sight worth your while. Monsoons paint this resort and the rainforest around with a heavenly lightness. The traditional architecture of this resort transports you to a bygone era. Studded with modern luxuries, the accommodation at this Exclusive Resort Stay at Meppadi is of wooden cabins that merge with the surroundings. Luxurious independent cottages and tree houses offer a tranquil retreat amidst the spectacular scenery. The family packages include accommodation, food, sightseeing, and guided trekking, while the honeymoon packages come with little extra indulgences like a honeymoon cottage, complimentary flower decorations, and arrangements for a romantic candle light dinner. The sparkling Soochipara waterfall, descending the valley, is just a hop away. Popular wildlife reserves and tourist sports of Wayanad are well within reach from this spectacular hideout. After a long day of sightseeing, rejuvenate with a cool dip in the swimming pool or a shower under the natural waterfalls inside the premises. A spice garden, as well as a picturesquely set multi cuisine restaurant, treats your palate to your heart’s content. Besides authentic Moplah cuisine and popular delicacies of Malabar, you will be spoilt for choice with Chinese and other Indian flavors. The walk-in wine cellar is a great spot to unwind and swap stories. A travel desk, room service, pickup facility from Meppadi, and Wi-fi availability are some services you can count on to improve your experience. Free Wi-Fi in the reception area. Enjoy pure oxygen and a mineral content natural waterfall at the Resort. 02 Kids below 6 yrs. One day sightseeing at Wayanad (Edakkal Caves and Soochipara Waterfalls). Guided trekking inside the resort: to the waterfalls, streams, natural pools etc. (subject to climatic conditions). Stay in a honeymoon cottage with private balcony. One day sightseeing at Wayanad( Edakkal Caves and Soochipara waterfalls). Bed tea/mineral water every day. Additional person will be charged extra. Check-in at 1 pm and check-out 12 noon. Online HDFC Payzapp facility available. Link will be provided by mail or mobile on request. Tax will be @10 % extra. Extra person- below 06 years complimentary - above 06 years chargeable. Check-outs from 12.00 to 18.00 hours are subject to 50% of the room rate and thereafter 100%. Cancellation up to 30 days prior to the check-in date, no charge applied. Cancellation between 30 days to 15 days prior to the check-in date, 25% of first day's room rate will be charged. Cancellation between 15 days to 7 days prior to the check-in date, 50% of total billing for booked period will be charged. Cancellation within 7 days to the check-in date, 100% of total billing for booked period will be charged. In case of No Show or cancellation of guaranteed reservation, the resort reserves the right to levy retention charges for entire reserved stay. Wayanad is a tourist paradise as well as a haven for nature lover which means there is enough to see and do. All the popular sightseeing spots are near the Resort. Head to Muthanga Wildlife Sanctuary for a guided safari through the heart of the dense forest. Wild species such as herds of elephants, deer, tigers, and monkeys as well as numerous birds and butterflies can be spotted in their natural habitat. Take boat rides on Pookkotte Lake or visit Banasura Sagar Dam and Reservoir, the largest earth dam in India, constructed across the tributary of Kabini River. Visit the historic Edakkal Caves with rock etchings dating back 5,000 years. For a more pious experience, pay a visit to the Tirunelli Temple or take a dip in the Papanashini River. Picnic at the Kuruva Islands is a surreal experience. These islands are evergreen forest abundant with rare species of birds, herbs, and orchids. If you are in the mood for vigorous outdoor thrills, venture out trekking to Pakshipadalam. It is an enthralling experience as the track is through dense forests and steep peaks. Meenmutty and Soochipara waterfalls are a must see. Meenmutty is at a height of 300 m and has three separate tiers. A 2-km adventurous trek can get you to the top. Soochipara is a powerful waterfall falling from a height of 100 to 300 feet and the pool below is a favorite spot for water rafting and swimming. Chembra peak, the tallest peak in Wayanad will leave you spellbound with its panoramic view of the countryside and a heart-shaped tranquil lake. If your heart yearns to stay back at the resort and relax, swing in a hammock and doze off or simply snuggle up with a book. Young guests can have a blast at the in-house children’s park or at the pool. A guided trek through the premises itself is a great way to get recharged through raw nature. The nearest airport is Calicut which is about 80 km (appx. 2.25 hrs) away. From Calicut take NH766 through Thamarasseri (31 km, appx. 1 hr) and head towards Vythiri crossing Adivaram. After crossing Vythiri at Chundale, take a right onto SH29. This road will take you to Meppadi and a few kilometers from there is the Resort. Perched on the cliff of the ghats, it overlooks the breathtaking valley. The mist and hanging clouds floating by adds to the mesmerizing view. During the monsoons, this place has an ethereal feeling. The cottages are comfortable, clean with basic amenities. The ones facing the valley have a beautiful view. The tree house also has a breathtaking view of the valley and waterfalls. The facilities can be enjoyed by all. Swimming pool, trek, natural waterfalls, are some of the attractions. WiFi only in the reception area. The restaurant caters to traditional Kerala cuisine as its specialty. Other cuisines are also on the menu. Perfect getaway for nature lovers . The peace and tranquility give a sense of calm. So pack your bags and head for a holiday that soothes your senses. The last stretch of the road is a dirt track. Surely adds to the natural beauty of the place. Stay: Exclusive Resort Stay At Meppadi Address: Valathur, Rippon P.O,Meppady, Wayanad,Pin Code: 673577, Kerala, India.